I think by now it’s obvious that I adore Amalie Howard, her writing style and her unique plots. I absolutely loved Waterfell and I remember being desperate to get my hands on its (untitled, at the time) sequel. And Oceanborn did NOT disappoint! The amount of character growth that I saw in Nerissa from Watefell to Oceanborn was incredible. She’s really come a long way from the bratty, snotty, “I’m better than you” character she was in Waterfell. She really embraces her heritage and destiny in Oceanborn – at least in the beginning (though I won’t elaborate, for fear of spoilers). She’s still very stubborn and single-minded in Oceanborn, though, especially when it comes to… certain things.. and she refuses to listen to reason on… certain things… At times, this got her in trouble. But it also lead her to exactly where she needed to be in the end. She also reaches a level of maturity in Oceanborn that allows her to look at things more objectively, to make choices that are for the greater good. She followers her heart, even when it means letting go of certain things. And then there’s Lo. He’s still just as swoony as ever, that I can promise. But Lo not remembering who Nerissa is, what he is (which, not a spoiler if you read the synopsis! ), it just broke my heart. He wasn’t the Lo we all came to know and love in Waterfell and it was pretty tough to read. The reasons behind his memory loss were horrifying, but they really played into the overall plot of Oceanborn and led to some startling revelations and shocking plot twists. Jenna was amazing, as always. She truly personifies the role of best friend. She’s the voice of reason and Nerissa’s confidant. I loved that she could stand up to Cara and her group of mean girls, where Nerissa couldn’t and wouldn’t. She was fiercely loyal and willing to stand up for herself, for what was right and for her best friend. But she also knew how to push back when she felt excluded, refusing to be seen as weak just because she isn’t Aquarathi. Speio is a tough character to talk about… He confused me and annoyed me at times. But he was always so fierce and loyal. One second, he was fighting with Riss like they truly were brother and sister. The next, he was angry and distant for seemingly silly reasons. But what happens in the end… Oh boy. I can’t even. It was shocking, unexpected, crazy, insane… I’m still trying to process it!! Cara, like Speio, was both confusing and annoying at times. I really wanted to punch her for the majority of the book. But I’m really happy with the direction her character went in and, if there’s a third book (FINGERS CROSSED!!!!!!! ), I’d be really interested in seeing where her character goes next, what kind of character development she goes through. The ending was explosive! I mean, I had my suspicions for a good portion of the book, but still. I knew something was up, I just couldn’t put my finger on it. I had one theory that was proven wrong, but I was close! All I know is if there isn’t a third book after that ending, I’ll throw a temper tantrum! 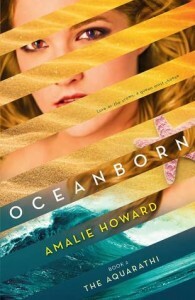 Overall, if you couldn’t tell from my gushing review, I absolutely adored Oceanborn. It was amazing, incredible and well worth the wait! I’m desperately hoping for a third book – fingers crossed! And, as always, my parting words to you are this: If you haven’t read any of Amalie’s books… WHAT ARE YOU WAITING FOR?!?!?! She’s definitely an auto-buy author for me, I highly recommend her books and I suggest you go check them all out RIGHT NOW! I don’t think I even need to say it, but I DEFINITELY recommend this book! GAH! I need to read these!